April 22, Earth Day, is a party for our planet. There are a variety of events celebrating Mother Earth over the next couple weeks in the local Los Angeles and South Bay area. Many of these are great, fun events for kids to learn how to be eco-friendly. Activities include children’s exhibits, environmental presentations, eco-friendly food, arts a d crafts, games, celebrity guests, displays and more than 200 rescued exotic animal and eco-friendly vendors. Teach your children to recycle. Featured are free paper shredding, free electronics and clothes drop-off, and used oil recycling and filter exchange. Space is limited for these shows so RSVP here. Learn what you can do to help our ocean planet at the aquarium’s 15th annual Earth Day festival. Join us for a weekend of family fun celebrating the Earth while learning easy, everyday tips to protect the environment. 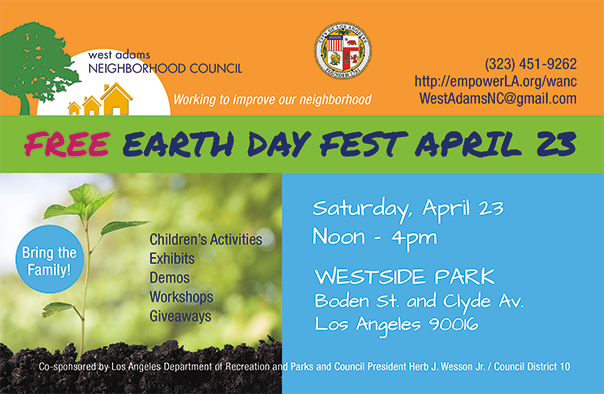 Visit booths from various Earth-friendly organizations and participate in hands-on learning demonstrations for people of all ages. An aquarium admission fee will be charged, but the event is free for Aquarium of the Pacific members. Saturday, April 30, from 11 a.m. to 4 p.m. 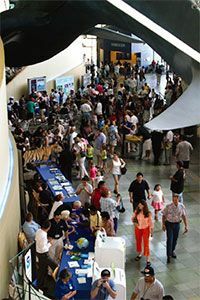 Enjoy live entertainment, speakers and presentations on the Eco-Education State, a composting class, children’s activities, an eco-shopping area, free bike valet parking, food and beverage vendors, an alternative fuel vehicle display, e-waste and printer toner cartridge recycling, and more. The event, now in its 20th year, will be filled with fun, uplifting, and educational activities. Enjoy arts and crafts and lots of games, too. Guests can enjoy food booths and two entertainment stages. A children’s parade inside the park begins at 1 p.m.